Ducru-Beaucaillou's Bruno Borie says 2018 will change Bordeaux's standards. Wine Spectator senior editor James Molesworth is in France for his 2018 vintage Bordeaux barrel tastings. While there, he's visiting the châteaus of some of the region's top estates, as well as some up-and-coming new producers. If you read my report on Bordeaux's 2016 vintage in the March 31, 2019, issue of Wine Spectator, you know that the epicenter of quality in that vintage was the upper Médoc appellations of St.-Estèphe, Pauillac and St.-Julien. With 2018 starting to play out in a similar fashion, at least in terms of weather and style, it would seem that a day in St.-Julien would yield promising wines. First stop: Léoville Barton, an estate whose 2016 is arguably the best ageworthy, blue-chip buy of the vintage. "The spring was really rainy, but right around the flowering we got a reprieve, which was a miracle," says Lilian Barton-Sartorius. "Then suddenly the summer was hot and dry, but the clay water table and old vines were well-suited for that." Well-suited indeed, as the 2018 Léoville Barton St.-Julien (82 percent Cabernet Sauvignon and 18 percent Merlot) is similar to the 2016 in style, with a torrent of boysenberry, blackberry and blueberry flavors that stay bright and vivid, but with even greater vibrancy and energy than the terrific '16, backed by licorice snap and iron accents on the finish. It's another beauty in the making. Even tipping just over the 14 percent alcohol mark, the wine retains a distinct freshness. Any overextraction wasn't an issue here, nor is it really ever, as the Bartons prefer a lighter hand in the cellar. "We're always very careful on extraction," says Barton-Sartorius. At Léoville's sister château, the 2018 Langoa Barton St.-Julien features vines with a northern exposure, opposite Léoville's southern exposure, resulting in a more forward feel, loaded with cherry paste and licorice notes and a shade less obvious grip than the Léoville. Of note here is the Moulis property bought by the Barton family in 2011, now named Mauvesin Barton. After three years of renovating the cellar and a continuing vineyard overhaul, the 2018 shines nicely, with very charming cherry, floral and sandalwood notes on an elegant frame. It is a delightful value in the making. Just a minute down the road stands Ducru-Beaucaillou, where Bruno Borie has been cranking out one of the region's most distinctly styled wines since 2000. And in a vintage where concentrated berries were the norm, Borie got exactly the raw materials he wanted to play with. "Very, very small berries and very thick skins, with unbelievably ripe pips. They were brown as hazelnuts," he says of the seeds, an indication of ripeness. "So in the vat there was no risk of astringent tannin or extracting too much, even with the higher alcohol of the vintage. At least, that's what I thought at first, because you don't really know until you're done. But we did know we had something exceptional and very different in '18." The 2018 Ducru-Beaucaillou St.-Julien grand vin here is a typical 85/18 Cabernet Sauvignon and Merlot blend, and it's sure to raise an eyebrow or too when it's tasted. It checks in at 14.5 percent alcohol yet wears it seamlessly. Thickly layered and extremely dense, but the texture is plush and polished as it moves along, rather than sitting heavily. It brims with blackberry and plum reduction notes inlaid with licorice and well-roasted apple wood. The superlong finish has steady drive, with a great graphite underpinning, rather than the racy feel typical in '18, and it's going to stand out for a long time. "We had 125 to 128 days from the flowering to harvest, a record," says Borie. "And we had the most days with temperatures above [86° F], another record. If you look at the analysis of the wines, you might think Ribera del Duero or something else. But the perception when you taste it is we are still extremely Bordeaux. I think we got the ripest Cabernet I can remember, but that's the change over time here. We now get a longer maturity process, but still don't end up overripe. Nothing will be the same after this. It's a marker. There are new standards now." While St.-Julien is a relatively small Médoc appellation with a remarkably consistent profile as a whole, there is diversity within its ranks. 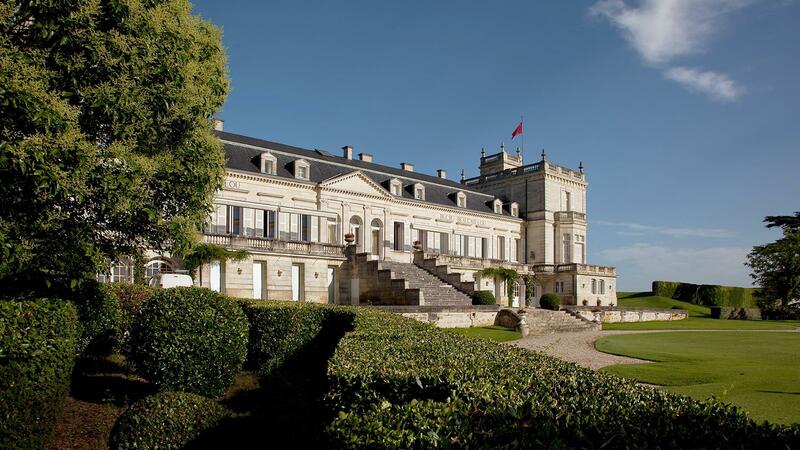 Just next door, at Château Beychevelle, the wine is still built around Merlot, rather than Cabernet Sauvignon, with the latter rarely topping the former in terms of percentage in the blend. And also standing out in 2018 is the hefty 4 tons per acre that director Philippe Blanc got from his St.-Julien vines, when the AOC as a whole averaged 3.1 tons per acre. Blanc is also now settled in to the new cellar, which was completed in time for the 2016 harvest. The 2018 Beychevelle St.-Julien grand vin represents a selection of 50 percent of the crop, with a blend of 50 percent Merlot, 41 percent Cabernet Sauvignon, 6 percent Petit Verdot and 3 percent Cabernet Franc. The Petit Verdot adds a spice and bramble note throughout, while the Merlot lays down a carpet of lush, inviting plum sauce flavor. The Cabernet Sauvignon adds cassis and a touch of muscle, without taking it out of balance, while the Cab Franc adds a hint of bass on the finish. Overall, the components add up to a generous feel, with a delicious array of blueberry, plum and black cherry compote flavors leading, all within a fresh and accessible framework (though this wine will age well too). The final neighbor in this quartet is Branaire-Ducru, whose 148 acres of vines are all west of the main road that cuts through the town and atop a hill, giving it a breezier, cooler terroir that results in a discintly floral, elegantly-styled wine. Owner Francois-Xavier Maroteaux counts on Jean-Dominique Videau to make the wine. "There were basically two periods in '18. Wet and difficult at first. Warm, dry and easy second," says Maroteaux. "The volume of water was not the issue, it was the constant humidity that resulted in the mildew pressure. But at the same time it helped in good canopy development, which we needed later on to protect the fruit. And then the conditions through September allowed for a long, slow ripening." "And there was really no blockage in maturity," says Videau. "Things slowed down but never stopped. Night temperatures were cool but not too low. It was a special combination that gave us ripe fruit but fresh flavors, tannic wines but with good acidity." The 2018 Branaire-Ducru St.-Julien grand vin is 14.3 percent alcohol, making it the only vintage other than the superb 2010 to cross the 14-degree threshold. You wouldn't know it, though, as the wine flows beautifully, led by a pure violet note that hangs effortlessly while plum and cassis flavors glide in. The finish is solid and persistent, but not heavy, sporting a very silky feel. Once again, this is as pure and elegant an expression of Bordeaux as you can find. "You've got the accessibility of '09 with the density and direction of '10 and '16," says Maroteaux. You can follow James Molesworth on Instagram, at Instagram.com/JMolesworth1, and on Twitter, at Twitter.com/JMolesworth1.